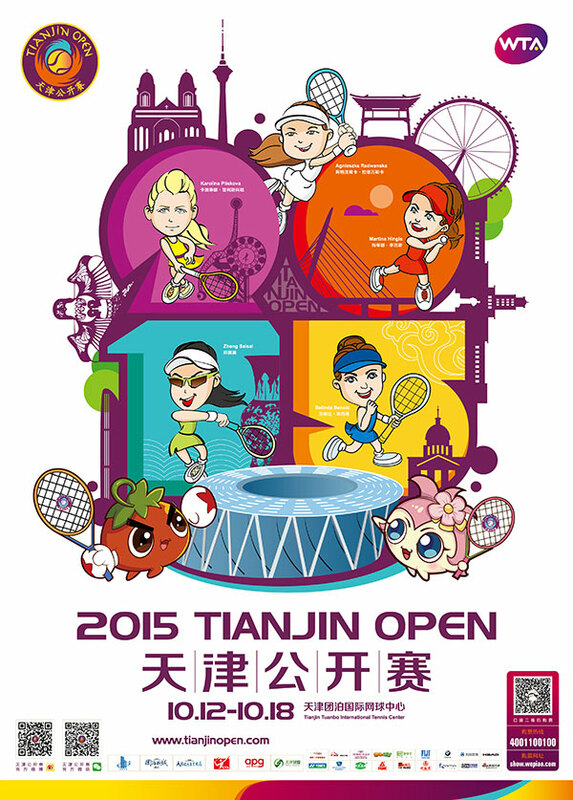 Look at this cartoon poster of WTA Tianjin Open. "Poland's Goddess" Agnieszka Radwanska, "Czech Rising Star" Karolina Pliskova, "Swiss Princess" Martina Hingis, "Tennis Future Star" Belinda Bencic, and "China's Gold Flower" Zheng Saisai are shown as 5 tour guides, along with 2 cute baby mascots Xiao (little) Fanfan (tomato) and Yangcong (onion) Meimei (girl). When goddesses wave the rackets in their hands, we can follow the directions that tennis balls falling on the ground, to explore Tianjin with the steps of Tianjin Open. Let's go! What a wonderful tour in Tianjin this October! The tournament mascots Xiao Fanfan and Yangcong Meimei have been dressed and waiting for you. Are you ready?